Rep. Joann Ginal, PhD, (D- Fort Collins) is no stranger to health care given her deep background in bioscience and pharmaceuticals, and as member of both the Colorado House of Representatives Health, Insurance and Environment Committee and the House Public Health and Human Services Committees. She’s also no stranger to ophthalmology as she worked with her ex-husband for years in his ophthalmology practice. Even with all of that experience, Rep. Ginal learned something new during a visit in July to the Eye Center of Northern Colorado to see CSEPS board of directors member Kent Bashford, DO, perform a cataract surgery. She remarked that surgery has become more sophisticated and intense over the years since she had last seen one. Kent Bashford, DO, (right) explains details of a surgery with Rep. Ginal (front left). 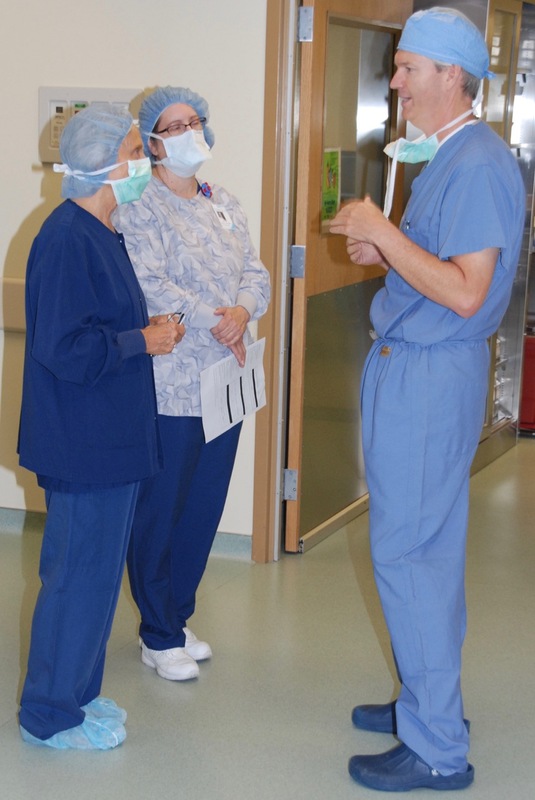 The visit was part of the CSEPS (i)mmersion Day project that connects legislators with local ophthalmologists to witness a surgery, get a first hand look at what it takes to run a practice and importantly build some lasting relationships. Are you interested in hosting a legislator at your practice? CSEPS is setting up more meetings for the fall so if you’re willing then please contact Chet Seward in the CSEPS offices. CSEPS is grateful to Rep. Ginal for her time and leadership. A big thanks also goes out to Dr. Bashford and his great team at the Eye Center of Northern Colorado. “I am so proud of ophthalmology and the way this profession does wonderful things for people,” concluded Rep. Ginal.